Make your brand stick around with custom Labels. This is the most common label stock, used for indoor applications where moisture resistance is not required. The bright white paper and semi gloss surface are ideal for colour reproduction, and the weight of the paper reduces tearing or wrinkling during application. 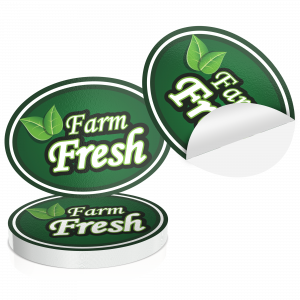 This is a durable vinyl label with a repositionable adhesive so the label can be removed and replaced. You can use this label for applications that require water resistance but don't need a permanent adhesive. This is ideal for indoor purposes, and applications where re-positioning may be required, such as hand labeling. This is a vinyl label with permanent adhesive for durability. You can use this label for applications that require water resistance, long lasting wear, and extreme temperatures like freezers. This is ideal for indoor and outdoor purposes. This is a clear label ideal for outdoor and indoor application. It has a permanent pressure sensitive adhesive and can be used in the freezer, however is not dishwasher safe. Due to the transparency of the stock, light colours will also be transparent as there is no opaque background. For this reason, it is recommended that light colours be avoided and artwork only contain dark colours. The piece will be a rectangle, with the height being the larger of the two dimensions, creating a portrait piece. The piece will be a rectangle, with the width being the larger of the two dimensions, creating a landscape piece. The piece will be a square, with the width and the height are the same. The piece will be round, with the width and the height will be the same. The piece will be round, with the width and the height will being different. The piece will be laminated with Silk Lamination to provide protection and structure. The lamination will go right to the edge of the piece with no lip, and so should not be used for an application where the item might be exposed to liquids. The piece will be laminated with Gloss Lamination to provide protection and structure. The lamination will go right to the edge of the piece with no lip, and so should not be used for an application where the item might be exposed to liquids. A matte coating will be applied to the piece, which is cured with Ultra Violet light. This coating provides protection against scuffing, as well as fading. As the coating is oil-based, it repels ink and should not be used with any application that needs to be written on, even with pen or felt-tipped markers. The order will be provided in bundles of 100, secured with rubber bands. The order will be packaged in batches of 250, and shrinkwrapped in plastic film. The order will be delivered in boxes with no additional packaging. 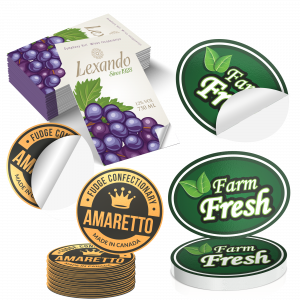 Establish your brand with uniquely designed and customized labels. 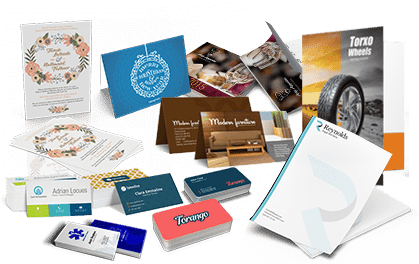 Labels are not only essential in ensuring a consistent brand identity and identifying products, but they also make great advertising and informational tools. 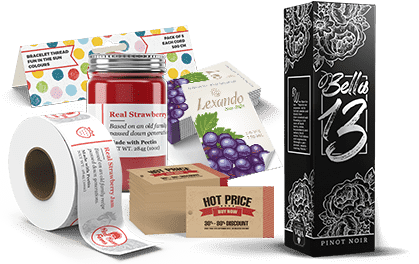 Labels often contain important details such as product descriptions, instructions, ingredients and typically carry persuasive marketing messages. 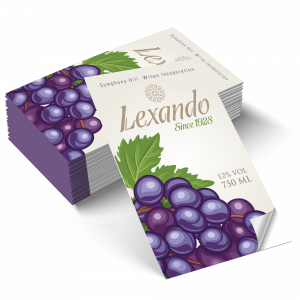 Labels are most commonly ordered as 3.5" x 4" on 60lb Gloss Label stock. 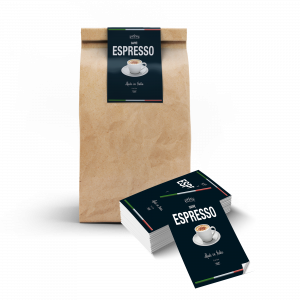 All labels are printed on the front in full colour (4/0) and coated UV front. 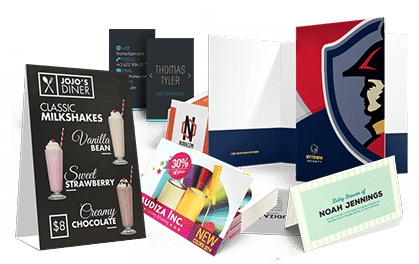 Labels give you the opportunity to add a unique design to represent your brand and clearly advertise your product. Use them to help you tell customers what a product is, how to use it, or why they want it. 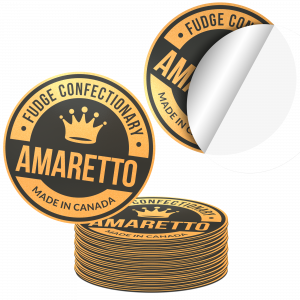 Labels can also make fun collectable stickers or be used at special events.